You are invited to join us on campus for our Second Annual Homeschool Day! 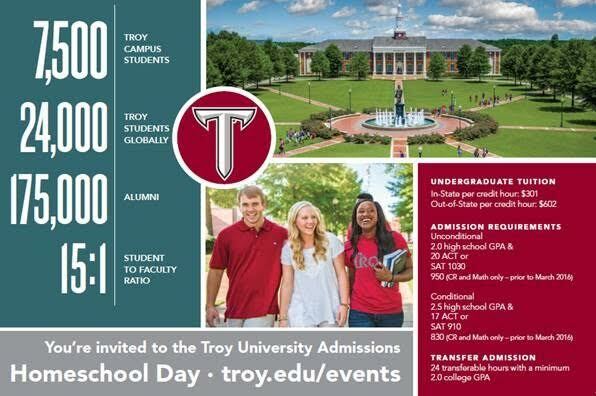 This day is specifically designed for Homeschool students who may be interested in Troy University. Homeschool Day’s activities will include a campus tour, breakout sessions about Campus Life, time to meet with Academic Departments for those who are looking to major in some of our top programs, and you will hear from current TROY students who were also homeschooled. Save the Date for March 31st! Please share this with the families within your school. For more information visit the website troy.edu/tours and register today!! Should you have any questions feel free to contact me directly. We look forward to seeing you and your students on campus!